Just a quick announcement about KontentMachine’s new update (2.15.10.40). – HTML Entities Replacement. We were notified that KM was scraping articles which contained character spun content so we made KontentMachine replace them with their standard equivalents. This is way better than just removing them because you are not actually losing any content at all. – Help File. We were so focused on adding new features so we totally forgot about tutorials on how to use them. We wrote a thorough help file and integrated it in KM. It contains not only references and information of what the different parts of KM are but also 20+ “How to”‘s. 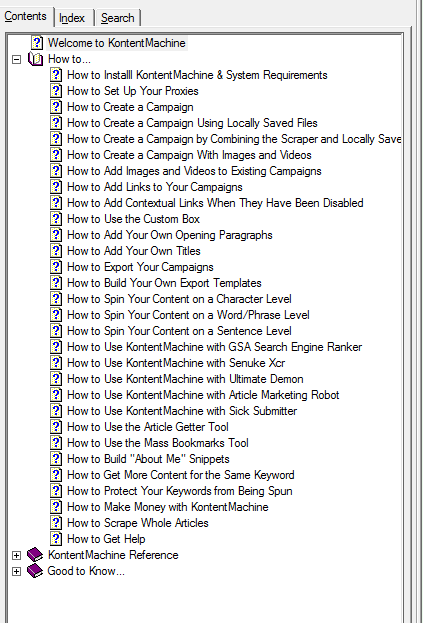 These tutorials will show you how versatile KontentMachine is when it comes to content creation. We will soon be moving to a new ticketing system that will help us give you guys even better (if that’s possible) support. We have already installed it and we are just testing it. As you may know we are working off a list with ideas and currently this list contains 68 items to keep us busy. We picked two of them for the next major update one of which you have never seen in any other content generation software. Oh yes, we are adding new videos and presentations for each of the tutorials from the help file. We will let you know when they are up.